New research reveals double-glazing and high security windows are top of homeowners wish lists, coming in ahead of period features, schools and shops. According to the poll, 69% of respondents listed central heating as their top priority, followed by double-glazing, listed by 68% of respondents, while high security doors and windows were cited by 65%. The poll by Gocompare, also found that potential buyers rated a good broadband connection, mobile phone reception and parking space and a garden more highly than garages or friendly neighbours. 46% of those surveyed also said that a good energy efficiency rating was a key priority. This is in contrast period features, which were not in demand while only 13% of those surveyed said access to good local schools was an essential factor in buying a new home. Gary Warby, Premier Windows said that it showed that house buyers were placing security and energy efficiency over and above other drivers. Premier Windows offers a full range of secure, low maintenance and thermally efficient windows and doors in an extensive choice of colours and finishes. They’re the product of millions of pounds of investment in energy efficiency, security and system development. 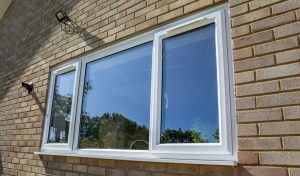 Manufactured in energy efficient and low maintenance PVC-U, they feature a thermally efficient outer frame featuring six ‘honeycomb’ chambers and five chamber sash, plus an energy efficient recycled composite material reinforcement. With deeper drainage channels carry water away quickly, they also feature 10mm cover on weather seals stopping draughts. The survey also revealed that conservatories no longer made the top 20-list of home features, having previously been popular with buyers. “This is probably more of an issue of perception said Ryan. It’s not surprising that traditional conservatories have perhaps lost popularity – they were perhaps never the most flexible of spaces. “However, if you asked buyers would a light-filled open but flexible year-round space be on their list, then I think you’d get a very different answer.